The Mid-Norfolk Railway Preservation Trust was established in 1995 with the aim of buying and restoring the then-disused line between the Norfolk market towns of Dereham and Wymondham. We currently own 28km (17.5 miles) of track and trackbed through central Norfolk's most attractive countryside, making us one of the largest preserved railways in the UK today. 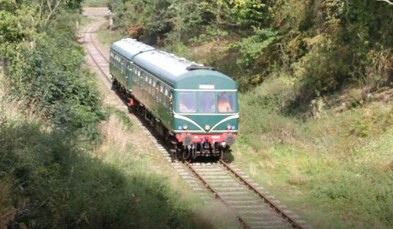 The line is operational between Dereham and Wymondham, and we own the disused northern section from Dereham as far as County School. The line is intact (although derelict) as far as North Elmham, and a further mile of track will need to be re-laid in order to reach County School. Our long-term aim is to reach as far as Fakenham. In addition to our passenger services to Wymondham, we also run fairly regular commercial freight trains, as well as the occasional railtour. These result in a wide variety of locomotives visiting Dereham from the main line from time to time, in addition to our fleet of heritage diesel locos. Many people are surprised to learn that the railway is entirely volunteer-run. Our volunteers get up to a wide variety of tasks, including driving the trains, maintaining the track and lineside, getting greasy inside engines, and many other interesting jobs besides. The rate of progress in restoring and upgrading the railway has been very rapid over the last few years, and we hope it will continue that way. Current projects are aimed at improving the railway's infrastructure, including track and signalling. In particular, we are working on building our first signal box, which will control the yard at Dereham; and we are busy restoring the line north of Dereham to operational condition.